Whatever your age, or ability, get a sense of personal achievement and satisfaction by becoming a SMILE Cafe volunteer! Do you want to feel good about helping others, as well as meet new people and make new friends, add to your social life, learn new skills, create a useful addition to your CV and have fun? Then why not ask about becoming a SMILE Cafe volunteer, whether on the management or operations side. We provide induction, and further training for those interested. •• learn new skills •• practise the skills you have •• become more confident •• put some volunteering experience on your CV •• pick up good ideas from other people •• show employers you can keep regular hours and handle commitment •• meet people who can help you find paid work •• have things to talk about in a job interview,and •• get references. However, we 're always interested to talk to anyone with experience in project management, administrative work, finance, fundraising, PR & media or teaching/training as well as general SMILE Cafe support activities. 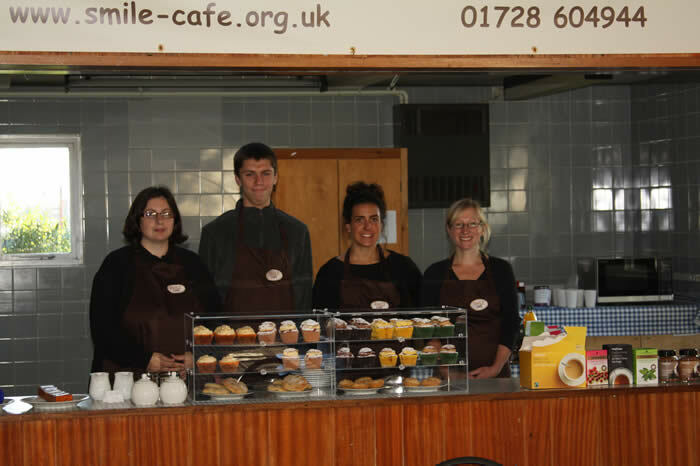 The SMILE Cafe Training Project provides individual training and development and social support to a dedicated team of volunteers. The volunteers particpate in catering and related accredited and informal training which is organised according to their aspirations, personal mneeds and abilities. These volunteers have a range of disabilities and special needs. The Cafe Training Project provides a cafe facility for people with a range of disabilities and special needs from the local Saxmundham and district community. Please use the contact information below to enquire about joining the volunteer team.